There's nothing like a brush with death to get you thinking about your life. Such was the case for Michael Franti, who already had a formidable rep as one of American music's most thoughtful artists even before the medical crisis that partially inspired his new album. In July of 2009, the San Francisco-based Spearhead frontman -- and former mastermind behind the Disposable Heroes of Hiphoprisy and the Beatnigs -- had to cancel several concerts when he was rushed into emergency surgery for a ruptured appendix. As Franti tells Spinner, the event had a profound impact on both his life and his music. "I thought I was going to check out," says Franti. "It really did re-prioritize things for me -- just the whole experience of being in the hospital, coming out of surgery and starting to realize that I was going to be okay. My girlfriend was there and my son was there, and someone brought a guitar into the room so I was able to play. I remember opening the curtain and seeing that there was sun that day and feeling, 'Oh man, it's so great that it's sunny outside!' I wanted to bottle that feeling and give it to other people for when they didn't have it in their lives." That desire also spawned his new EMI album, 'The Sound of Sunshine,' which contains 12 new songs, including two versions of the buoyant title track. The singer says all of the new songs possess the same uplifting spirit too -- even when they address hardships. "In that way," says Franti, "this album was really written about today and the world that we're in, though, it's a really personal record for me." 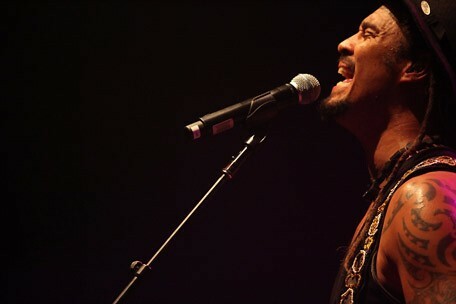 Indeed, it's become increasingly difficult to separate the personal and the political in Franti's work, much to the benefit of his songwriting. Though he's never been shy about pushing for peace, human rights and other causes in his music, recent experiences have inspired him to take a more holistic and even upbeat approach. Coming from a guy who's visited many of the world's worst conflict areas and most destitute countries -- travels documented on his FrantiV youtube clips and the recent music doc 'Sounds Like a Revolution,' as well as his own 2007 film 'I Know I'm Not Alone' -- his optimism is definitely of the hard-won variety. "Everywhere I go, I see how music plays in people's lives," he says. "It's usually in the places that you think are the worst off and in the worst political situations and the worst economic situations. You'd think these are the places where people feel the most despair, desperation and anger, but it's usually in those places I find the most joy and the greatest desire to move beyond the situation. Music becomes a way to get through today and into tomorrow." That realization encouraged a change in his own perspective too. "I guess the message in my music has gone from a political message to a message that I just want to inspire people no matter what they are facing in life so they can overcome it. For some people that's being in a war zone. For other people, it might be approaching that girl in their fourth-grade class at a dance," he laughs. "I want to be there for both." And thanks to the commercial breakthrough that Franti and Spearhead experienced two years ago -- surprise Top 20 single "Say Hey (I Love You)" off his 2008 album 'All Rebel Rockers' -- more listeners than ever have been sharing those special moments with him. Though the band's been busy this year with opening slots for John Mayer and their own summer tour, Franti still sounds surprised to see so many new faces. "I would say half the people at our shows are people who haven't seen this before," he says. "That may not seem remarkable to some bands, but we are a band that has been out on the road since 1994. A lot of people have become die-hard fans and they come to shows year after year and month after month, so we'd see the same faces. Now we're seeing a whole new group of people." "We figured all these people hadn't heard our songs anyway so we'd play a bunch of new ones," he says. "After we saw what the response was, we would go back into the dressing room where we had a portable studio set up. We'd say, 'This one needs to be faster, or maybe it needs different chords on the chorus, or maybe it means a new line in the verses that people can sing along to more easily.' In that way, this record was really shaped by the audience. We recorded 80 percent of it in dressing rooms on tour." Whereas many artists just have to guess how audiences will respond to new material, Franti and Spearhead were able to thoroughly road-test the latest songs and make sure audiences responded the way they hoped. "We've done a lot of those records where it sounds great in the studio, and then you go out on the road and you have a tough time reproducing it," says Franti. "That's because you put down 10 different guitar parts, and you've only got two guitarists. Or else, you get out there and you realize that this song that you thought was a really great dance song is really an acoustic ballad or vice versa. We always change the songs to be the best they can be. They are never in my mind finished -- they are always growing on tour." Franti is proud to say that he and the band can play every new song live just as it sounds on 'The Sound of Sunshine.' That's good news for fans who are happy to see that Franti and Spearhead receive some long-overdue success, even if it does seem a little strange that one of the music world's most reliable political provocateurs has adopted such a sunny disposition. "It's ironic when I think about that," he says with a laugh. "It's kind of bizarre that the same person who wrote 'Television, the Drug of the Nation' [the scathing 1992 track by Disposable Heroes of Hiphoprisy] would be the same person who has these summer hit songs on pop radio two years in a row. But the reason that people resonate with my songs is because they always talk about serious times or difficult situations but look for the hope for in it, or look for the brightness in them. Plus, he notes, "you can dance to it."